Medical personnel will track runners and record medical data to ensure timely updates for families of runners being treated. This information will be available at the MCM Info/Med Info Tent on North Meade Street in the Finish Festival. The American Red Cross also will have a medical information tent located at the Route 50 circle, adjacent to the U.S. Marine Corps War Memorial. One of the MCM’s largest groups supporting “The People’s Marathon” is the Medical staff consisting of the physicians, nurses, Corpsmen, physical therapists and administrators assigned to the Naval Health Clinic Quantico, located aboard Marine Corps Base Quantico. This team has supported the MCM for over 25 years. The clinic staff make up the leadership team of most aid stations, comprising an Officer in Charge (OIC), and a Senior Enlisted Leader (SEL) and a Supply Petty Officer (SPO). They are specially trained in treating Exertional Heat Stroke in runners along with other common running injuries. In addition, medical volunteers arrive from across the country having specialties in sports medicine physicians, as registered nurses, physical therapists, athletic trainers, podiatrists and other general volunteers to ensure MCM participants are properly treated. Should a runner need additional care in a hospital setting, the MCM has seven area hospitals prepared to provide care. Each of these hospitals is familiar with MCM protocols and has a medical liaison to assist runners and families should a hospital stay be required. Locating ill or injured runners, or spectators, in areas of the Finish Festival and finish area; connecting those participants with medical resources, either by helping them to an Aid Station, or by calling for additional support; and assisting roving medical personnel or EMS with locating ill, or injured, participants in a crowd. Helping spread safety messages and other important information to runners and spectators in the Finish Festival. Logistical support for aid stations along with other specialized volunteers in the area of communication and mass casualty. MedStar Sports Medicine is proud to be the sports medicine partner of the Marine Corps Marathon. With more than 80 physicians and athletic trainers, MedStar Sports Medicine is the region's premier choice for athletes at all levels. From getting the right diagnosis, to surgery if needed, to rehabilitation, the experts of MedStar Sports Medicine help athletes return to the activities they love. Learn more at MedStarSportsMed.org. IIRM Sports Medicine Conference Series, Washington, DC: Sponsored by MedStar Sports Medicine, this two-day medical meeting will focus on topics related to running medicine and providing care in medical tents at endurance events. 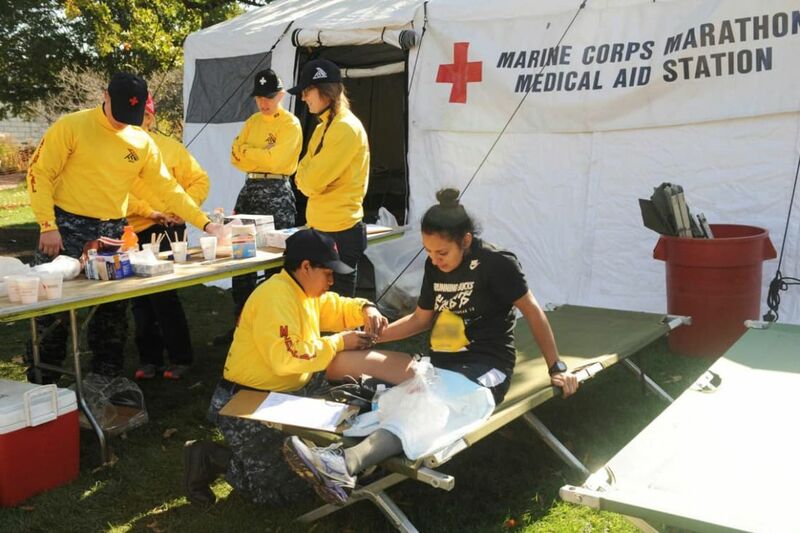 Attendees are invited to volunteer in the medical tent at the Marine Corps Marathon for additional CME credit hours, or run with an invitational entry for the SOLD OUT event.